McQueen celebrates after his film was awarded best picture. The slavery drama "12 Years A Slave" won the Academy Award for best picture on Sunday, making history as the first movie from a black director to win the film industry's highest honour in 86 years of the Oscars. 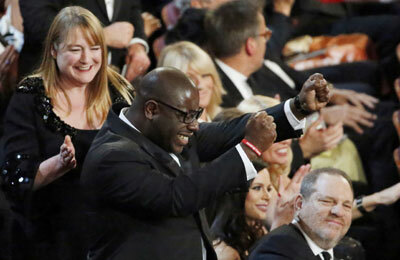 British director Steve McQueen's unflinching portrayal of pre-Civil War American slavery won two other Oscars, including best supporting actress for newcomer Lupita Nyong'o and best adapted screenplay based on the memoir of Solomon Northup, a free man tricked and sold into slavery in Louisiana. "Everyone deserves not just to survive but to live. This is the most important legacy of Solomon Northup," said McQueen in his acceptance speech. "12 Years a Slave," prevailed over space thriller "Gravity" from Mexican filmmaker Alfonso Cuaron, which nevertheless racked up the most Oscars of the night with seven, including the best director honour for Cuaron, a first for a Latin American director. Referring to the "transformative" experience he and others undertook in the four-plus years spent making "Gravity," Cuaron, whose hair is graying, said, "For a lot of these people, that transformation was wisdom. For me, it was just the colour of my hair." "As random and subjective as this award is, it means a great deal in a year of, yet again, extraordinary performances by women," said Blanchett, who beat out previous Oscar winners Bullock, Amy Adams, Judi Dench and Meryl Streep. The big loser of the night was director David O Russell's 1970s crime caper "American Hustle," which walked away empty-handed despite earning 10 nominations, the same number as "Gravity." Martin Scorsese's tale of financial greed, "The Wolf of Wall Street," also failed to take home Oscars. But it was also a night of predictable wins for heavy favorites. The tale of Nordic princesses, "Frozen," won best animated film, a first for Disney Animation Studios since the category was introduced in 2002, and its girl-power anthem "Let It Go" won best original song. Comic and talk show star Ellen DeGeneres returned as Oscar host on Sunday, bringing a deadpan affability, and pizza, to the Academy Awards show while still poking fun at Hollywood royalty. In her easy breezy style, DeGeneres mixed with the crowd liked she did back in 2007, taking a star-studded selfie with the likes of Brad Pitt and Angelina Jolie that broke the record for retweets on Twitter. And she largely avoided the ribald humor that landed her predecessor Seth MacFarlane in hot water last year. Kenyan actress Nyong'o was one of the big stars of the night, not only for her winning pale blue Prada gown on the red carpet, but also for her touching speech. In accepting the first award of the night for "12 Years a Slave," Nyong'o, 31, paid homage to her character, who picked more cotton than anyone else but suffered at the hands of her besotted yet evil master. Sunday capped an unusually long awards season, extended by the Winter Olympics, and for "12 Years a Slave" it spells the end of six months of both high acclaim and uncertainty over awards stemming from the perception that it was a hard film to watch. The film from studio Fox Searchlight compelled Oscar voters to go see the film with the ad 'It's Time," fearing that they might skip it and throw their weight behind "Gravity." It has earned nearly $140 million at the worldwide box office, a fraction of the $700 million for "Gravity." Following is a list of winners in leading categories. BEST ACTOR: Matthew McConaughey in "Dallas Buyers Club"
BEST ACTRESS: Cate Blanchett in "Blue Jasmine"
BEST DIRECTOR: Alfonso Cuaron for "Gravity"
BEST SUPPORTING ACTOR: Jared Leto in "Dallas Buyers Club"
BEST SUPPORTING ACTRESS: Lupita Nyong'o in "12 Years a Slave"
BEST ADAPTED SCREENPLAY: "12 Years a Slave"
BEST ANIMATED FEATURE FILM: "Frozen"
BEST DOCUMENTARY FEATURE: : "20 Feet from Stardom"
BEST ORIGINAL SONG: "Let It Go" from "Frozen"
BEST COSTUMES: "The Great Gatsby"
BEST MAKE-UP AND HAIRSTYLING: "Dallas Buyers Club"